Benedict XVI has recognised his heroic virtues. Until the 1960s, Jews praised the war-time Pontiff, and appreciated him for saving hundreds of thousands of Jews; then, things changed. The “dark legend” emerged, aided by the Communist nations. Milan (AsiaNews) – Pope Benedict XVI has approved the heroic virtues of Pius XII, generating negative reactions in Jewish and secular circles who have always opposed the ‘Pastor Angelicus’, venerated by many who also turn their prayers towards him. I read “Der Papst, der Hitler trotzte” (The Pope who Defied Hitler)” which rebuts the lies about Eugenio Pacelli, according to which he favoured Hitler’s rise to power and was silent about the Jewish Holocaust. As nuncio to Germany, Eugenio Pacelli was against Hitler from the start. Nothing good would come from that “crazy fanatic”, he said. His reports to Rome and his actions in Germany show that view beyond the shadow of a doubt. 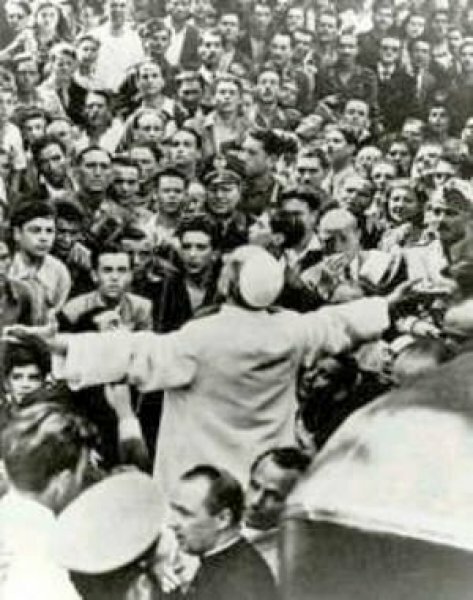 As Pope Pius XII, Pacelli mobilised Vatican diplomatic resources and the Church’s network of dioceses, parishes, institutes and agencies to save Jews, and during the war, he was able to obtain hundreds of thousands of entry visas to Argentina, the Dominican Republic and Latin America for refugees from Nazi Germany. Despite Pius XII’s efforts, a violent campaign was launched against his “silence” but no one protested against the silence of Roosevelt, Churchill, Stalin, not even that of the Red Cross, which was involved in rescuing refugees from Nazism and forced into silence to save as many as possible. According to research by Israeli historian Pinchas Lapide, the Catholic Church directly helped save between 847,000 and 882,000 Jews (250,000 in Romania, 200,000 in France and Hungary, 55,000 in Italy, etc.). Hesemann reprints statements from Jewish figures who until 1963 thanked Pope Pius XII. In 1943, Chaim Weizmann (future first president of the State of Israel) wrote that the “Holy See is lending its powerful help wherever it can, to mitigate the fate of my persecuted co-religionists”. Isaac Herzog, Chief Rabbi of British Palestine, in 1944 expressed gratitude for what the Pope and his delegates “are doing for our unfortunate brothers and sisters in the most tragic hour of our history”. On 21 September 1945, Leon Kubowitzky, secretary general of the World Jewish Congress, thanked the Pope for his interventions, and the World Jewish Congress donated ,000 to Vatican charities “in recognition of the work of the Holy See in rescuing Jews from Fascist and Nazi persecutions”. In the closing days of the war Moshe Sharett, Israel’s second prime minister, met with Pius and “told him that my first duty was to thank him, and through him the Catholic Church, on behalf of the Jewish public for all they had done in the various countries to rescue Jews”. In 1955, the Union of Italian Jewish Communities proclaimed 17 April“Day of Gratitude” for the Pope’s wartime assistance. Until the 1960s, Jews had only praise for Pius XII’s action in rescuing persecuted Jews. However, in 1963, a campaign against the Pontiff began in earnest when a play titled ‘The deputy’ was published. It was written by an unknown German, Rolf Hohhot, who had never consulted Vatican or Nazi archives. Hesemann’s book shows that Hochhuth’s play was the work of the Soviet KGB. Hopefully, Russia will open its archives from the Soviet era. Yet the issue went unnoticed in the world press. “The Deputy’ had an immediate success. Soon it was being around the world, backed by Communist parties in the West and leftwing publications. Whenever the claims made in play were denied, there were no echoes in the international press. The pope declares Pope Pius XII and John Paul II "venerable"